$37 - Newly designed by Truly Me, this fall 2017 dress is a welcomed arrival. The design is cut for a fit through the bodice that opens for the A line skirt. Stripes cover the fabric completely. These stripes include fun patterns mixed with many different colors. 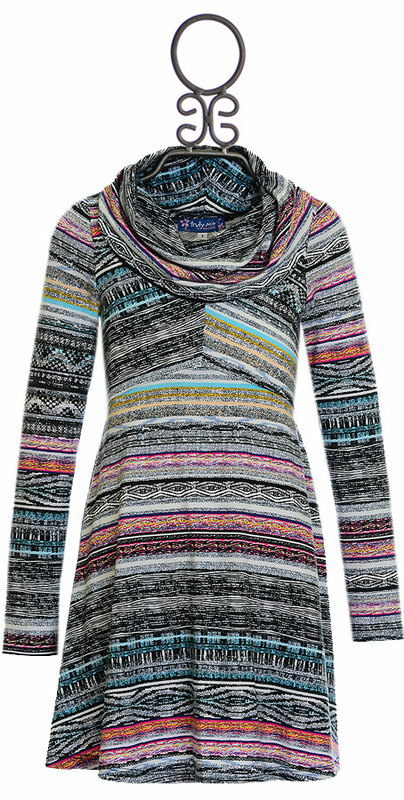 We love the cowl neckline, a cozy look for the chillier months. Be sure to check out all of the other new arrivals from Truly Me, Hannah Banana and Baby Sara; you won't be disappointed! 95% Polyester and 5% Spandex Shell. 100% Polyester Lining. Hand Wash Cold Inside Out, Dry Flat.